When mothers raise their voices, they cannot be ignored. Among the most riveting examples are Argentina's Mothers of the Plaza de Mayo. Starting as a handful of women, they grew to become a national force and an international inspiration, powered, against all odds, by love for their children. 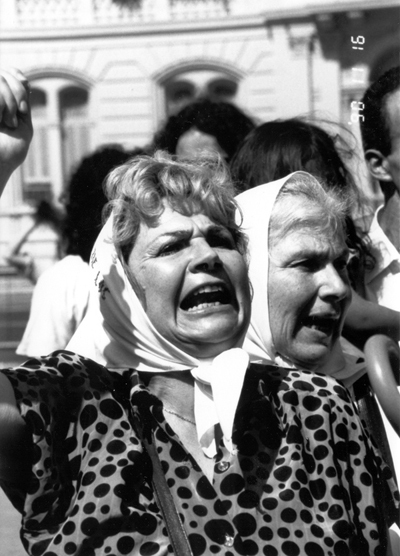 Clip from the 1985 film Las Madres, The Mothers of the Plaza de Mayo, Argentina, the Academy Award nominated documentary by Susana Muñoz and Lourdes Portillo. During the 1970s and 1980s, 30,000 of Argentina's sons and daughters were kidnapped, tortured and killed in the country's "Dirty War." Military juntas were deployed to annihilate left-wing opposition from trade unionists, students and activists. When the government's fear tactics had forced much of the population into silence, a group of mothers refused to hide themselves away. The mothers demanded to know the fate of their "disappeared" children by gathering and being seen. Linked arm and arm, they circled the plaza outside the Presidential Palace in Buenos Aires, carrying their children's photographs and names. It was not a single dramatic protest march. The mothers marched every Thursday afternoon at half past three, for thirty years. Their chant was always the same: "Bring them back alive." This simple, repeated action captured the world's attention, transforming the fate of the "disappeared" into an international human rights cause. When civilian government was restored in 1983, the perpetrators of the "disappearances" were put on trial. Many received little or no punishment. The government offered the mothers reparation: $250,000 per child. Arguments over whether to accept payment split the group into two. Still, the mothers marched, joined now by a grandmother's group. Many of the "disappeared" women were pregnant when they were taken. The grandmothers searched for this next generation of lost children. To date, they've located over eighty grandchildren. In 2006, the Mothers groups officially stopped protesting for the "disappeared," but they still gather each week in the Plaza to march for other causes. On this page you can view a clip from the 1985 film Las Madres, The Mothers of the Plaza de Mayo, Argentina, the Academy Award nominated documentary by Susana Muñoz and Lourdes Portillo. The following excerpts are from Circles of Love Over Death: The Story of the Mothers of The Plaza de Mayo. Author Matilde Mellibovsky gathered first-person testimonies from 21 Mothers. She, herself, is the mother of a "disappeared" child. I was excessively shy and had trouble doing things. Once what happened to my daughter had occurred, it was as if I had awakened, and for her sake I would do anything, and I forgot about my shyness. Never, never did they ask us anything at all as we walked in our circle, except our names, not even our last names. ... And I remain branded, and tied forever to the struggle and the objectives of the Mothers. The strength that one of us lacked on a certain day, another had for that occasion. The other had words of consolation, for pushing us to keep on going, worlds of valor, of courage, and so we kept on. I keep on looking for my children and everybody else's children, because to me your daughter is my daughter, she's a little bit mine. My children are a little bit yours. We mothers agreed that we should wear something so that we could recognize each other just in case some of us were detained. At this point we talked about wearing a white head-band in the Vietnamese style, or a white handkerchief, which everybody carries in her hand bag. This is what I remember. The "March of the Posters." ... We were a whole bunch of mothers, each one carrying a poster with a hugely enlarged photograph of her disappeared child. ... We held the posters high so that over our heads beautiful faces appeared, youthful, full of life; our children's faces. And how did people passing by us react? At first, surprised, dumbfounded, they stopped. Their eyes remained fixed on the eyes in the photos; the posters remained immobile; immobile also the faces of the passersby. They looked at each other. Because the photos were not simply portraits. They demonstrated an unquestionable existence that had to be restored. Here they were-with these very faces, this is the way they were-with these looks, these expressions, and these poses. We were showing our countrymen the dreadful truth the dictatorship took pains to hide in thousands of ways. The fact that such a tragedy did not paralyze us, but on the contrary, stimulated us, is amazing. It gave us strength to start on a path that we had never thought we were going to take. At the outset, we asked, begged, repeated petitions so that we would get some news about our children. Had they been swallowed up by the earth? Afterwards, we confronted the dictatorship directly to demand their return. We were not worried about who was the stronger. Our love for our children made us defy their whole repressive apparatus.